Thanks to its high positioning accuracy and responsiveness, the MR-E Super is an excellent choice for applications ranging from 100 W to 2 kW. The MR-E Super is available with pulse-train input for position and internal speed control or analog input for speed and torque control. The amplifier features Mitsubishi Electric’s legendary auto-tuning and vibration suppression functions. Set-up and diagnosis is easy with the Windows based software MR-Configurator. Compared to its performance the MR-E Super is an excellent choice for very cost-effective and economical servo solutions. The Mitsubishi general-purpose AC servo system MR-E Super can perform operation in different control modes, e.g. position/internal speed control. Hence, it fits a wide range of applications such as precision positioning and smooth speed control of machine tools and general industrial machines (e.g. packaging, processing or labelling machines). 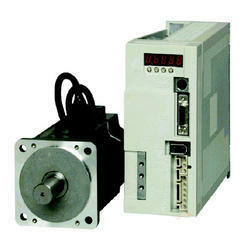 For the MR-E Super series a wide range of motor sizes from low to medium inertia are available. Hence this new servo can be considered as a powerful system for any general-purpose application, but at the same time, a cost-effective solution for the replacement of stepping motors or DC servos. All MR-E Super servo motors are equipped with an incremental position encoder and offer a high level of internal protection. The compact component size is critically important to machine designers who are often called upon to squeeze all of the control solutions they need into the smallest deliverable package. The MR Configurator software package makes tuning and diagnostics quick and easy and includes powerful graphical machine analysis and simulation functions. Advanced suppression of mechanical vibration. Meeting global norms and standards.